After what felt like the longest winter ever, we were able to bask in a glorious and sunny May! Being a ‘sun worshipper’, I enjoyed hours of reading and topping up my tan in the garden. It’s probably just as well that we don’t have that much sunshine here normally, else I’d get absolutely nothing done over the weekends! And who didn’t shed a tear watching the Royal Wedding? Ok, maybe it was just me! I’m a fan of the TV show Suits so still can’t believe ‘Rachel Zane’ has married a prince! I saved 36.3%! My average savings rate has now gone down to 48.5%. Had a couple of unplanned social outings and as mentioned last month, I had to pay my sister back as she’d booked and paid for my ‘holiday within a holiday’ (a few days in Thailand). These next few months are going to be rather ‘spendy’ so I probably won’t be able to tighten up the finances until after the summer. The above savings was topped up with £24.80 from TopCashback*, £500 matched betting funds (used to invest in Freetrade as per my previous post), and £133.91 affiliate income from OddsMonkey (thanks to all who signed up via my links!). The markets have been going up, although shenanigans around the world might make it go down again. Whatever. In any case, my Future Fund has jumped quite a bit, now at £143,620, steadily making progress towards my next big milestone. 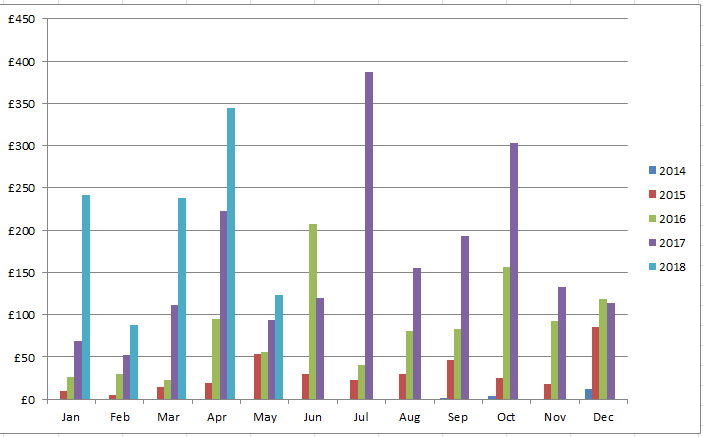 £123.27 was received, which has meant that I now only have one month in the year (Feb) where dividends were under £100. I’m fairly confident that I’ll cross that line next year. Back in 2015, getting £100 a month in dividends was just a dream – I’ve come a long way since then! Total dividends this year stands at £1,033.80, still ever so slightly behind plan but some big payouts on the way! A better month compared to April, although I really should have taken my own advice and avoided the no-lay accumulators (accas) in the last (mad) weekend of the football season – I ended up with a £70 loss! Lesson learned! The EW betting was better, although I’ve been trying to find a level (value of stakes and volume of bets) I’m happy with so there was a lot of variance throughout the month, with ROI ending up at around 11%. Overall MB profit for the month was just £290.20 so not bad but should be better. 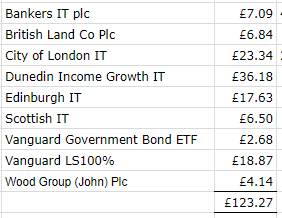 Total MB profits so far this year stand at £1,326, so still not on target but I’m getting a bit more confident that I may just get there if I keep at it. I’m going to be out of the country for part of the World Cup so will miss out on some of the MB offers, although I have got around £30 worth of free bets banked, ready to place on the tournament when it starts. As mentioned before, the matched betting guide I subscribe to is OddsMonkey*. Great for beginners and experienced matched bettors alike with quality tools such as the Each Way Matcher, Extra Place Matcher, Dutch Finder, Racing Matcher and Acca Matcher. There are step by step guides and also a friendly forum for you to ask questions. Anyway, check out the free trial*. At this stage, I’m behind on all my goals but I’ll keep plugging away at them. I have actually started reading a non-fiction book so should be able to tick one off next month. For those interested, you can also see how I’m getting on with my Book Bingo here – I’ve crossed off another square! Good news – this month, I celebrated my 1 year job anniversary – wow, the time has just whizzed by! I instigated a salary review conversation with my boss, but the bad news is that no one is getting a pay rise this year as the company didn’t hit their profit targets – roll on next year! The other news is that there is going to be some company ‘restructuring’ but since I don’t know how this will affect me, no sense in worrying about it. Hope you all had a great May! This entry was posted in Books, Dividend Investing, Earnings, Expenses, Investment Trusts, matched betting, Portfolio, Savings, Shares, Work by weenie. Bookmark the permalink. It was certainly great to get the good weather and enjoy some sun (and made sitting out in the rugby worthwhile!). Ill hold my hands up and say I saw none of the wedding… or suits! A very good month and its amazing how fast you are ticking up to that next milestone, almost half way and it only feels like it was a few months ago that you set it – great stuff! Breaking the 4 figures so far for the year in income has got to be a good feeling, and reinvesting them means it is only going to get more and more as time goes on! Congratulations on your 1 year anniversary with work, a shame about the no pay rise but hopefully next year – be glad you aren’t living pay cheque to pay cheque! Ah restructuring – always a worrying sign when these things happen, our company are doing the same this summer – but hopefully I should be safe, but you never know! Still loving the nice weather and hoping it’ll last as long as possible! Yes, really striding towards halfway to my milestone, just keep plugging away at it and I may get there a lot quicker than anticipated. Am really happy to have hit the 4 figure dividend sum already – when I first started investing for income, it just seemed like a really far away goal. Yeah, shame about the pay rise but like you say, I’m not living pay cheque to pay cheque. No news on the restructuring although now, they’re calling it a ‘reorganisation’, which doesn’t quite sound so sinister! Yes weenie, like you enjoying the sunny weather and looking forward to the Summer season of sport..cricket, tennis and World Cup. Your dividend graph is starting to look good and looking forward to seeing how the race to £200K works out with your future fund…hope you can get a boost from the matched bets over the rest of the year! Yes, I’ll miss the UK football but am looking forward to the World Cup, plus the tennis. Not a huge fan of cricket, although for some reason, I always check the results! The dividend graph does look good (colourful!) and it’s interesting to see the high and low paying months. Need some luck with the matched betting – might be rather sporadic for June and July though as I’ll be on hols soon. Hi Weenie, you must have absolutely loved the May weather – it’s been so hot! And yes, the royal wedding got me as well – it was so sweet as well as ridiculously extravagant. And congrats on your one year anniversary at the job – fingers crossed all is ok for your role in the restructure. Even though you aren’t crushing all the goals, you are still making very good progress towards them – and we all need an audacious goal or two to keep us going. Yes, I’ve been loving this weather – tough during the week when I’ve been stuck in the office but nice to walk through city centre in the sunshine. I actually prefer not to be crushing my goals, because if I am, then I’ve set my goals too low! I think my goals are all achievable but challenging, so yes, I need them sort of out of reach to keep me going! Looking good. You’re WAY more diversified than I am! Do you find it takes a lot of time to keep track of it all? Setting up the initial spreadsheets probably took some time but I wouldn’t say it takes me a long time to keep track of all the various investments. But then, right now, I have time and enjoy doing it. At some point, I may find that I don’t want to tweak about with spreadsheets so I’ll continue to simplify, ie sell and switch investments. 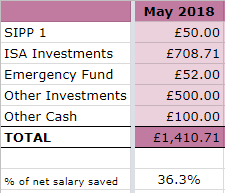 Great to see your progress, and when though you think the percentage savings are low you still stashed £1,400 away which is probably £1,400 more than most people. The Future Fund is starting to snowball now, and over £1,000 in dividends in 5 months (which I assume you re-invest, so will earn more dividends themselves next year). I am going to have a look at matched betting in the future as it will allow me to take less out of my holdings to cover living costs, so will use your link to OddsMonkey when I do. Can I ask how much time it needs to earn the amount you achieve? I look forward to following your continuing progress. I do think the snowball effect is just starting – continuing to add capital and yes, reinvesting all my dividends. Still slow growth but every bit adds a bit more. There is a correlation between time spent matched betting and profits made – more time spent = greater profits. The time I spend can range from 10-18 hours a month – I just fit it around my life. In the early days, I was doing a lot more but I’m happy with the time I spend on it and with the profits. In the early days, you will be doing sign up offers, ie opening new betting accounts to take up their new account offers. After that, you’ll be doing what are called ‘reload’ offers. Thanks in advance for signing up via my Oddsmonkey link! Matched betting isn’t everyone’s cup of tea – you will probably know after a month of doing it if it’s something you want to continue with. Call me cynical, but it sounds like your employer have adopted the Big Bank mentality – announce a restructuring at the same time as salary reviews. When people are happy to have kept their job, then they won’t complain about a stagnant salary. A 40% increase in your future fund in 15 months sounds much faster than your forecast of 5 years. Hope the markets stay kind and march on upwards! Well, in the same breath that ‘restructuring’ was mentioned, they reminded us that we were paid a small bonus even though the company hadn’t hit the year end targets. They probably thought we would feel fine about that but of course, now people are seeing the bonus as a sweetener before the bad stuff happens! As mentioned above, they’re now using ‘re-organising’ instead of ‘restructuring’, so plans have been changed already, though we don’t know what. The 40% increase was helped by my redundancy pay, so growth will be slower in the next 5 years! You’re still making money on MB which is more than I can say – I’ve had my first zero month. I lost a few accounts and there haven’t been so many offers flying around and so I’ve lost my mojo for it. Have you posted anything about the EW strategy you are using? It feels like I need something new to get my interest piqued again. I’ll drop you a note about the EW betting – there are a couple of decent threads on the OddsMonkey forum so I’ll send the links to you. Hi Weenie, really interesting to see your monthly breakdown. I’m a bit behind on my goals for the year (I was aiming for a 60% savings rate – a tad unrealistic! ), but the main thing is to keep plugging away at them as you say. If you’re a sun-worshipper, you’ll absolutely adore Thailand right now – sunny everyday. Thanks for stopping by. 60% is an awesome goal to go for – you must have a good savings rate in general to be aiming high, so well done! Goals need to be challenging so we can keep plugging away at them. I’ve got a few days in Koh Samui at the end of June so looking forward to the hot weather! You might have only saved 36% of your income but that’s £1400 a month which is seriously good going. Plenty of people fritter that away every month then complain they don’t have any money. If I keep saying it, I might eventually do it (world’s worst procrastinator here) I REALLY need to crack on and give Matched Betting a go. I think it would suit me as it’s about attention to detail. I will get there at some point this year, but not in time for the World Cup – that’s far too soon!! Tuppenny recently posted…May Money Focus – the results and a saga! As I mentioned to @Financial Independence UK, matched betting isn’t for everyone but it sounds like it could be up your street – my attention to detail waivers occasionally, which is when I make mistakes! Opening a few accounts for the World Cup might be the right time as there will be a lot of offers on. However, there’s no rush of course, after the World Cup, then the domestic football will be starting and cue lots more offers!